Welcome back to the BAAMA Journal! I’m thrilled to be the new editor. I’ve worked with GIS for over twenty years and love maps of all kinds, as you can see below in one of my vacation photos. Erez Cohen is the new BAAMA Journal Assistant Editor, and deserves all the credit for the slick new web design. I hope you like some of the new things we’ve added to this issue. First of all, we are moving away from the traditional newsletter PDF format in favor of a layout better suited for web viewing. Second, there are more articles than past issues to reward you for waiting so long between publications. 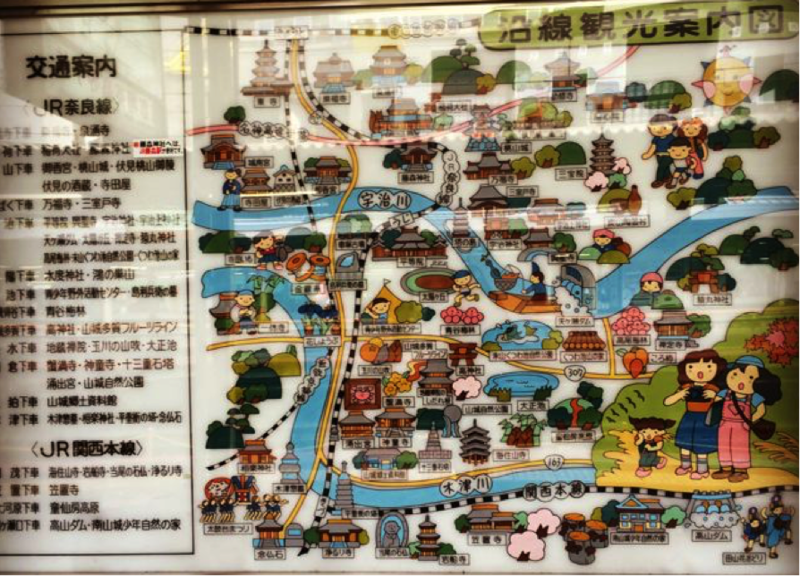 …and my favorite map from my trip to Japan in March. We have a fantastic bunch of authors in this issue. Dr. Emily Read and her colleagues from the US Geological Survey described how they created the loveliest interactive map I’ve ever seen from USGS. Several snapshots from their California drought website are included in the map gallery to compliment their article, but you must visit the URL to fully appreciate their mapping style and finesse. If you’ve ever felt guilty for not having enough time to volunteer then you must read Dan Specht’s article about volunteering online at your own pace using OpenStreetMap.org. Doug George and his colleague let me experiment with the formal peer review process on their piece about mapping coastal headlands, and intern-turned-full-timer Simon Hochberg wrote about ‘big data’ changing the future of GIS. You can also read some of the results of the BAAMA workforce survey and a lovely success story from a job seeker who landed her dream job through the BAAMA job board. And, my favorite oddball GIS story topic has to be Victoria Heifner’s description of using an old-school manual printing press to make wedding invitation maps that have been featured in Martha Stewart Weddings. Wow! In the Map Gallery, you’ll find maps from two student contributors, and great new stuff from USGS and the San Francisco Estuary Institute. Last but not least, we still have the beloved BAAMA “Where in the Bay Area” contest. If you’re lucky maybe I’ll send out a goofy prize to the winner…. Tell us what you think. Is the new layout easy to read? Would you like to see featured maps and articles show up in your Facebook feed? Want to contribute a map or story of your own? Please write to me at journal@BAAMA.org with your feedback and contributions.